Getting Crafty with Jamie: Baja, Lacy Patio Party! I found that I was Looking for a quick n easy card... I nabbed our DSP Patio Party, Baja Breeze and Whisper White papers. 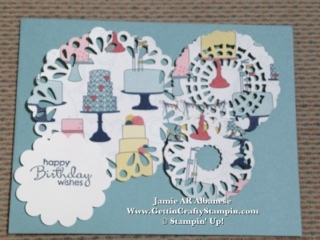 The Delicate Doilies Sizzlits punched out these cute birthday cake doilies. I used my stylus pop out the lil Chads. 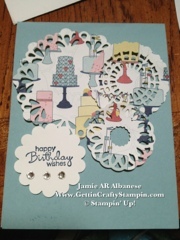 Using my Stampin' Dimensional adhesive to make it all layer and Pop! 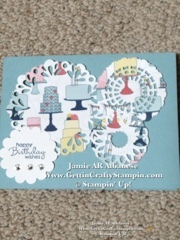 I used the 1 3/4" Scallop Circle and stamped the Happy Bday sentiments from the Petite Pairs greetings set. I stamped the Midnight Muse inked sentiment on Whisper White and punched out the words, layered them a bit on one another and then used our adhesive backed rhinestones. Easy and a lovely card to receive. I hope you enjoy!